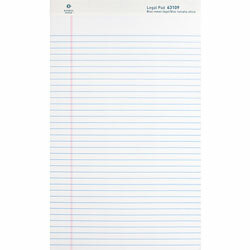 Legal-ruled pads feature microperforated sheets for clean tear-out and sturdy, 30 point chipboard backing. 16 lb. paper. Each pad contains 50 sheets. White Ruled Glue-Top Writing Pads from Business Source! 611 In Stock today.